The tool I received for evaluation was a 12mm spindle gouge complete with handle. 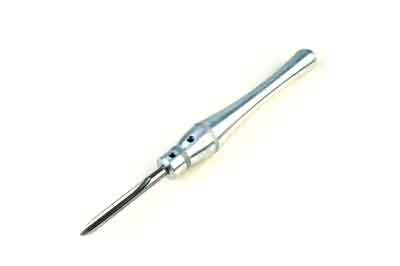 The tool is one of a range manufactured by Carter and Son Toolworks in Seattle, USA. The blades are machined from solid round-bar stock and made from M42 Cobalt HSS steel - the flute looked slightly deeper than some other makes of spindle gouge. They are individually inspected and arrive presharpened and ready to use, packed in an individual plastic tube and come with a lifetime guarantee. The handles are shaped and designed to be comfortable and are turned from solid aircraft grade aluminium. The hole for the blade is drilled out of the stock and, overall, feels more solid than hollow or filled alternatives. The blades and handles are available together or individually and they fit together via two grub screws. The grub screws in the handle close down onto two machined flats on the blade; this gives a really positive fastening and saves potentially marking the blade over time, which, from experience, can look unsightly and make for a poor fit. 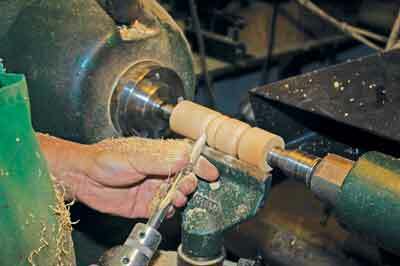 Initially the tool was used on a length of dry cherry (Prunus spp.) about 50mm in diameter between centres. I spend some time making a number of beads, coves and 'V'-cuts. The blade was like a razor and cut effortlessly. The grind was longer than many spindle gouges and I would describe it as almost a 'detail gouge' profile. As a consequence, I was initially quite tentative with my cuts, but in the event, had no problems with it. The second timber was dry and hard old ash (Fraxinus excelsior). I was making a sphere around 85mm diameter and after initial shaping using a spindle roughing gouge, I used the spindle gouge to shape the sphere. The cuts across the end grain were perfect due to the blade's sharpness rather than me. Next, I used very fresh cut wet yew (Taxus baccata) to turn a thin-walled piece. As expected, the edge cut well and really cleanly, but there was a slight tendency for the wet shavings to grab and block the front end of the flute. This may have been due to the flute being slightly deeper than usual. However, overall, the sharpness of the edge made the work a pleasure. Over the course of three weeks, the gouge attended three club nights with me and was examined and used by several members. The only negative comments from one individual being that the handle felt too heavy. As there was some debate as to whether or not the handle would feel cold to the touch in winter, I put the gouge in the fridge overnight and turned with it in the morning. While it was initially cold, it soon came back to room temperature and I don't think this is likely to be an issue. During the period the gouge was used to turn spheres in sycamore (Acer pseudoplatanus), yew, a pepper mill in acacia (Robinia pseudoacacia) and fly tying stands in walnut (Juglans regia) and oak (Quercus robur). I deliberately didn't sharpen the tool until the final club event and then wiped the edge with a 'fine' diamond card, and even after all this work, the edge was still extremely sharp. My first impressions of the tool were that a) the blade was ground in what I would describe as a fingernail detail grind, with a ground second bevel; b) the blade was razor-sharp; c) the handle was heavy and d) the shape and feel of the handle was comfortable and solid. As it was received, this is the sharpest turning tool that I have handled in 47 years of woodturning, and after several days of use and before any resharpening, it was still sharper than my other freshly sharpened comparable tools. The handle 'fits right' in the hand and although some may feel it too heavy, to me, the weight and solid feel were just right. It takes a lot to make a tool distinctive but I can describe this spindle gouge and handle in one word - beautiful. I would definitely recommend looking at them.